Picture windows maximize natural light and create a comfortable feel to the room. Picture windows provide a completely unobstructed view of the outdoors and bring natural light into your home. Picture windows cannot be opened, but will allow more natural light into your home. If you're looking to replace your old picture window or simply want a different look, the experts at Energy Swing Windows can install a replacement picture window in the material of your choice, including vinyl and wood. We offer free estimates on all of our replacement window services in Monroeville, West Mifflin, Bethel Park and throughout the nearby areas in Pennsylvania. Call us today at 1-844-385-9318 or click below to get started! Our vinyl picture windows feature a one-of-a-kind design. There's no more getting out the ladder or stretching and straining to clean. All you have to do is pivot the window inside to clean the outer surface of the glass. Energy Swing picture windows offer a distinct advantage over traditional picture windows, especially in high bay or bow openings. Most older, traditional fixed picture windows are cleaned from the outside only. They are very difficult to clean from the second floor or when in a bay or bow opening. These problems become a thing of the past when you choose our picture windows! Contact your local window experts at Energy Swing Windows to schedule a free consultation today! We manufacture and install the highest quality windows available, including a full lifetime warranty. 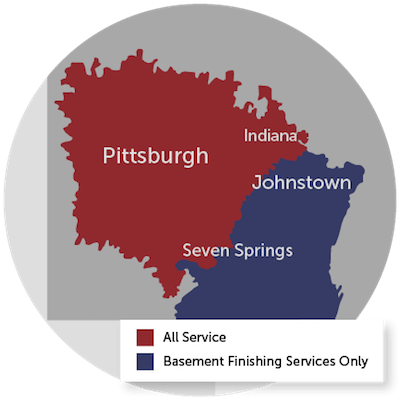 We provide free, no-obligation estimates for all window replacements in Bethel Park, Monroeville, West Mifflin, McKeesport, Irwin, New Kensington, Greensburg, Export, Trafford, Coraopolis, Latrobe, Bethel Park, Canonsburg and throughout Pennsylvania.